These highlights do not include all the information needed to use NEUPRO safely and effectively. See full prescribing information for NEUPRO. To report SUSPECTED ADVERSE REACTIONS, contact UCB, Inc. at 1-844-599-2273 or FDA at 1-800-FDA-1088 or www.fda.gov/medwatch. NEUPRO is indicated for the treatment of Parkinson's disease. NEUPRO is indicated for the treatment of moderate-to-severe primary Restless Legs Syndrome. In patients with early-stage Parkinson's disease, the recommended starting dose for NEUPRO is 2 mg/24 hours. Based upon individual patient clinical response and tolerability, NEUPRO dosage may be increased weekly by 2 mg/24 hours if additional therapeutic effect is needed. The lowest effective dose is 4 mg/24 hours. The maximum recommended dose for early-stage Parkinson's disease is 6 mg/24 hours. In patients with advanced-stage Parkinson's disease, the recommended starting dose for NEUPRO is 4 mg/24 hours. Based upon individual patient clinical response and tolerability, NEUPRO dosage may be increased weekly by 2 mg/24 hours if additional therapeutic effect is needed. The maximum recommended dose for advanced-stage Parkinson's disease is 8 mg/24 hours. In patients with Restless Legs Syndrome, the recommended starting dose for NEUPRO is 1 mg/24 hours. Based upon individual patient clinical response and tolerability, NEUPRO dosage may be increased weekly by 1 mg/24 hours if additional therapeutic effect is needed. The lowest effective dose is 1 mg/24 hours. The maximum recommended dose is 3 mg/24 hours. NEUPRO is applied once a day. The adhesive side of the transdermal system should be applied to clean, dry, intact healthy skin on the front of the abdomen, thigh, hip, flank, shoulder, or upper arm. The transdermal system should be applied at approximately the same time every day, at a convenient time for the patient. Because NEUPRO is administered transdermally, food is not expected to affect absorption and it can be applied irrespective of the timing of meals. 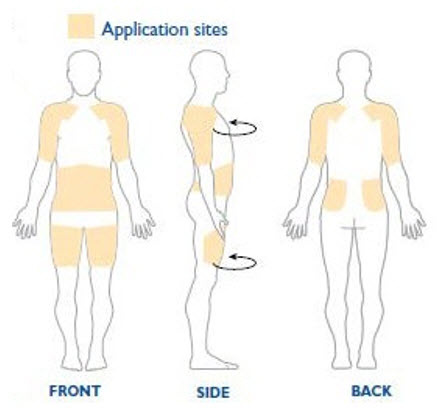 The application site for NEUPRO should be moved on a daily basis (for example, from the right side to the left side and from the upper body to the lower body). NEUPRO should not be applied to the same application site more than once every 14 days and should not be placed on skin that is oily, irritated, or damaged, or where it will be rubbed by tight clothing. If it is necessary to apply NEUPRO to a hairy area, the area should be shaved at least 3 days prior to NEUPRO application. 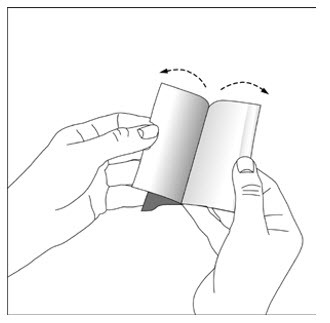 The system should be applied immediately after opening the pouch and removing the protective liner. 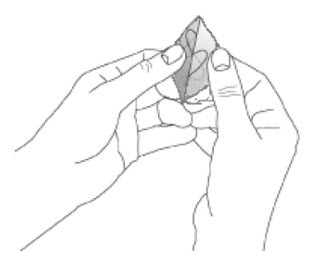 The system should be pressed firmly in place for 30 seconds, making sure there is good contact, especially around the edges. If the patient forgets to replace NEUPRO, or if the transdermal system becomes dislodged, another transdermal system should be applied for the remainder of the day. The prescribed dose may be achieved using single or multiple patches [see Patient Counseling Information (17)]. For discontinuation of NEUPRO in patients with Parkinson's disease, reduce the daily dose by a maximum of 2 mg every 24 hours preferably every other day, until complete withdrawal of NEUPRO is achieved. For discontinuation of NEUPRO in patients with Restless Legs Syndrome, reduce the daily dose by 1 mg every 24 hours preferably every other day, until complete withdrawal of NEUPRO is achieved. Transdermal System: 1 mg/24 hours, 2 mg/24 hours, 3 mg/24 hours, 4 mg/24 hours, 6 mg/24 hours, and 8 mg/24 hours of rotigotine. NEUPRO is contraindicated in patients who have demonstrated hypersensitivity to rotigotine or the components of the transdermal system. NEUPRO contains sodium metabisulfite, a sulfite that may cause allergic-type reactions including anaphylactic symptoms and life-threatening or less severe asthmatic episodes in certain susceptible people. The overall prevalence of sulfite sensitivity in the general population is unknown. Sulfite sensitivity is seen more frequently in asthmatic than in nonasthmatic people. Patients with early- and advanced-stage Parkinson's disease and with Restless Legs Syndrome treated with NEUPRO have reported falling asleep while engaged in activities of daily living, including the operation of motor vehicles, which sometimes resulted in accidents. Although many of these patients reported somnolence while on NEUPRO, some did not perceive warning signs, such as excessive drowsiness, and believed that they were alert immediately prior to the event. Some of these events have been reported as late as one year after initiation of treatment. In clinical trials in patients with Restless Legs Syndrome, 2% of patients treated with the maximum recommended NEUPRO dose (3 mg/24 hours) reported sleep attacks compared to 0% of placebo-treated patients. It has been reported that falling asleep while engaged in activities of daily living always occurs in a setting of pre-existing somnolence, although patients may not give such a history. For this reason, prescribers should reassess patients for drowsiness or sleepiness especially since some of the events occur well after the start of treatment. Somnolence is a common occurrence in patients receiving NEUPRO. In patients taking the maximum recommended NEUPRO dose, there was an increased risk of somnolence for early-stage Parkinson's disease (NEUPRO 19%, placebo 3%), for advanced-stage Parkinson's disease (NEUPRO 32%, placebo 28%), and for Restless Legs Syndrome (NEUPRO 10%, placebo 4%). Prescribers should also be aware that patients may not acknowledge drowsiness or sleepiness until directly questioned about drowsiness or sleepiness during specific activities. Patients should be advised to exercise caution while driving, operating machines, or working at heights during treatment with NEUPRO. Patients who have already experienced somnolence and/or an episode of sudden sleep onset should not participate in these activities while taking NEUPRO. Before initiating treatment with NEUPRO, patients should be advised of the potential to develop drowsiness and specifically asked about factors that may increase this risk with NEUPRO such as concomitant sedating medications and the presence of sleep disorders. If a patient develops daytime sleepiness or episodes of falling asleep during activities that require active participation (e.g., conversations, eating, etc. ), NEUPRO should ordinarily be discontinued [see Dosage and Administration (2.4)]. If a decision is made to continue NEUPRO, patients should be advised not to drive and to avoid other potentially dangerous activities. There is insufficient information to establish whether dose reduction will eliminate episodes of falling asleep while engaged in activities of daily living. There was an increased risk for hallucinations in patients with advanced-stage Parkinson's disease treated with NEUPRO. In patients taking the maximum recommended NEUPRO dose, the incidence of hallucinations was 7% for NEUPRO and 3% for placebo, and this treatment difference increased with increasing dose. Hallucinations were of sufficient severity to cause discontinuation of treatment (mainly during the dose escalation/titration period) in 3% of advanced-stage Parkinson's disease patients treated with the maximum recommended dose of NEUPRO compared with 1% of placebo-treated patients. Hallucinations have also been reported in post-marketing reports. Post-marketing reports indicate that patients may experience new or worsening mental status and behavioral changes, which may be severe, including psychotic behavior during NEUPRO treatment or after starting or increasing the dose of NEUPRO. Other drugs prescribed to improve the symptoms of Parkinson's disease can have similar effects on thinking and behavior. This abnormal thinking and behavior may consist of one or more of the following: paranoid ideation, delusions, hallucinations, confusion, disorientation, aggressive behavior, agitation, and delirium. These various manifestations of psychotic behavior were also observed during the clinical development of NEUPRO for early- and advanced-stage Parkinson's disease and Restless Legs Syndrome. Patients with a major psychotic disorder should ordinarily not be treated with NEUPRO because of the risk of exacerbating psychosis. In addition, certain medications used to treat psychosis may exacerbate the symptoms of Parkinson's disease and may decrease the effectiveness of NEUPRO [see Drug Interactions (7.1)]. Dopaminergic agonists, in clinical studies and clinical experience, appear to impair the systemic regulation of blood pressure, resulting in postural/orthostatic hypotension, especially during dose escalation. Parkinson's disease patients, in addition, appear to have an impaired capacity to respond to a postural challenge. For these reasons, both Parkinson's and Restless Legs Syndrome patients being treated with dopaminergic agonists ordinarily (1) require careful monitoring for signs and symptoms of postural hypotension, especially during dose escalation, and (2) should be informed of this risk. An increased risk for decreases in systolic and diastolic blood pressure were observed when supine, standing, and changing from supine to standing position in patients treated with NEUPRO. In patients taking the maximum recommended NEUPRO dose, orthostatic (change from supine to standing) decreases in systolic blood pressure (at least 20 mm Hg or greater) was 16% for NEUPRO and 14% for placebo in patients with early-stage Parkinson's disease, 32% for NEUPRO and 27% for placebo in patients with advanced-stage Parkinson's disease, and 13% for NEUPRO and 11% for placebo in patients with Restless Legs Syndrome. More severe decreases in systolic blood pressure (40 mm Hg or greater) and in diastolic blood pressure (20 mm Hg or greater) also occurred more frequently (NEUPRO incidence at least 2% greater than placebo) in patients with early- and advanced-stage Parkinson's disease during measurements when supine, standing, or changing from supine to standing position. Patients experienced dose-related decreases in blood pressure at different times throughout the trial including the final visit. An analysis using a variety of adverse reaction terms suggestive of orthostatic hypotension, including dizziness/postural dizziness and others, showed an increased risk for all patients treated with NEUPRO. For the maximum recommended NEUPRO dose, the incidence of adverse reactions suggestive of hypotension/orthostatic hypotension was 29% for NEUPRO and 11% for placebo in early-stage Parkinson's disease, 27% for NEUPRO and 23% for placebo in advanced-stage Parkinson's disease, and 8% for NEUPRO and 7% for placebo in Restless Legs Syndrome. This increased risk for symptomatic hypotension and decreases in blood pressure was observed in a setting in which patients were very carefully titrated, and patients with clinically relevant cardiovascular disease or symptomatic orthostatic hypotension at baseline had been excluded from this study. The increased risk for significant decreases in blood pressure or orthostatic hypotension occurred especially in the dose escalation/titration period. Syncope has been reported in patients using dopamine agonists, and for this reason patients should be alerted to the possibility of syncope. Because the studies of NEUPRO excluded patients with clinically relevant cardiovascular disease, patients with severe cardiovascular disease should be asked about symptoms of syncope and pre-syncope. Patients may experience intense urges to gamble, increased sexual urges, intense urges to spend money, binge eating, and/or other intense urges, and the inability to control these urges while taking one or more of the medications, including NEUPRO, that increase central dopaminergic tone and that are generally used for the treatment of Parkinson's disease. In some cases, although not all, these urges were reported to have stopped when the dose was reduced or the medication was discontinued. Because patients may not recognize these behaviors as abnormal, it is important for prescribers to specifically ask patients or their caregivers about the development of new or increased gambling urges, sexual urges, uncontrolled spending, or other urges while being treated with NEUPRO. Physicians should consider dose reduction or stopping the medication if a patient develops such urges while taking NEUPRO. Some patients treated with NEUPRO exhibited increases in systolic blood pressure (greater than 180 mm Hg) and/or diastolic blood pressure (greater than 105 mm Hg) while supine or standing. In patients with advanced-stage Parkinson's disease, this increased risk for systolic blood pressure greater than 180 mm Hg was 5% for NEUPRO and 3% for placebo and for diastolic blood pressure greater than 105 mm Hg was 4% for NEUPRO and 0% for placebo. In patients with Restless Legs Syndrome, this increased risk for diastolic blood pressure greater than 105 mm Hg was 8% for NEUPRO and 4% for placebo. Increases in systolic blood pressure (at least 20 mm Hg or more) and in diastolic blood pressure (at least 10 mm Hg or more) occurred more frequently (incidence at least 5% greater than placebo) in all patients (i.e., early- and advanced-stage Parkinson's disease and Restless Legs Syndrome) taking the maximum recommended NEUPRO dose. These increases in systolic and diastolic blood pressure were observed when supine, standing, and changing from supine to standing position. More severe increases in systolic blood pressure (40 mm Hg or more) and in diastolic blood pressure (20 mm Hg or more) also occurred more frequently (incidence at least 2% greater than placebo) in NEUPRO-treated patients with early- and advanced-stage Parkinson's disease and with Restless Legs Syndrome during measurements when supine, standing, and/or changing from supine to standing position. In the placebo-controlled trials, there was an increased risk for hypertension as an adverse reaction with the maximum recommended NEUPRO dose in patients with advanced-stage Parkinson's disease (NEUPRO 3% vs. placebo 0%) and Restless Legs Syndrome (NEUPRO 4% vs. placebo 0%). Some patients treated with NEUPRO exhibited increased pulse (greater than 100 beats per minute) while supine and/or standing. In patients with advanced-stage Parkinson's disease, there was an increased risk (at least 2% greater than placebo) of increased pulse for patients taking the maximum recommended NEUPRO dose. In patients with Restless Legs Syndrome, there was an increased risk (at least 5% greater than placebo) of increased pulse for patients taking the maximum recommended NEUPRO dose. These findings of blood pressure and heart rate elevations should be considered when treating patients with cardiovascular disease. Patients taking the maximum recommended NEUPRO dose for early-stage Parkinson's disease had a higher incidence (2%) of substantial weight gain (more than 10% of baseline weight) than patients taking placebo (0%). In advanced-stage Parkinson's disease, the incidence of weight gain more than 10% of baseline weight was 9% in NEUPRO-treated patients (for the maximum recommended dose) and 1% in placebo-treated patients. This weight gain was frequently associated with the development of peripheral edema in patients with Parkinson's disease, suggesting that NEUPRO may cause fluid retention in some Parkinson's patients. In patients taking the maximum recommended NEUPRO dose, the incidence of peripheral edema was 3% for NEUPRO and 2% for placebo in early-stage Parkinson's disease and 9% for NEUPRO and 1% for placebo in advanced-stage Parkinson's disease. These treatment differences increased further with treatment at NEUPRO dosing above the maximum recommended doses. Monitor for weight gain and fluid retention when treating patients with concomitant illnesses such as congestive heart failure or renal insufficiency. NEUPRO may potentiate the dopaminergic side effects of levodopa and may cause or exacerbate pre-existing dyskinesia. For the maximum recommended NEUPRO dose, the incidence of dyskinesia was increased for NEUPRO (NEUPRO 14% vs. placebo 7%) in patients with advanced-stage Parkinson's disease, and this incidence increased with increasing dose. Patients treated with the maximum recommended dose of NEUPRO also had an increased risk (NEUPRO 3% vs. placebo 0%) for early discontinuation from the study because of dyskinesia. Application site reactions (ASRs) occurred at a greater frequency in the NEUPRO-treated patients than in placebo-treated patients in the double-blind, placebo-controlled, dose-response studies with NEUPRO. For the maximum recommended NEUPRO dose, the incidence of application site reactions was 32% for NEUPRO and 19% for placebo in patients with early-stage Parkinson's disease, 36% for NEUPRO and 13% for placebo in patients with advanced-stage Parkinson's disease, and 43% for NEUPRO and 4% for placebo in patients with Restless Legs Syndrome. ASRs exhibited a dose-dependent relationship for all doses for patients with early- and advanced-stage Parkinson's disease and Restless Legs Syndrome. ASRs were also of sufficient severity to cause study discontinuation for patients with early-stage Parkinson's disease (NEUPRO 3% vs. placebo 0%), advanced-stage Parkinson's disease (NEUPRO 2% vs. placebo 0%), and Restless Legs Syndrome (NEUPRO 12% vs. placebo 0%) who were treated with the maximum recommended NEUPRO dose. The signs and symptoms of these reactions generally were localized erythema, edema, or pruritus limited to the patch area and usually did not lead to dose reduction. Generalized skin reactions (e.g., allergic rash, including erythematous, macular-papular rash, or pruritus) have been reported at lower rates than ASRs during the development of NEUPRO. In a clinical study designed to investigate the cumulative skin irritation of NEUPRO, daily rotation of NEUPRO application sites has been shown to reduce the incidence of ASRs in comparison to repetitive application to the same site. In a clinical study investigating the skin sensitizing potential of NEUPRO in 221 healthy subjects, no case of contact sensitization was observed. Localized sensitization reactions were observed in a study with healthy subjects by continuously rotating a 0.5 mg/24 hours transdermal system, after induction of maximal irritational stress was achieved by repetitive transdermal system application to the same site. If a patient reports a persistent application site reaction (of more than a few days), reports an increase in severity, or reports a skin reaction spreading outside the application site, an assessment of the risk and benefits for the individual patient should be conducted. If a generalized skin reaction associated with the use of NEUPRO is observed, NEUPRO should be discontinued. Augmentation is a worsening of RLS symptoms during treatment, leading to an increase in overall symptom severity or earlier time of symptom onset each day compared to before initiation of treatment. Use of dopaminergic medications, including NEUPRO, may result in augmentation. Rebound, an exacerbation of RLS symptoms, is considered to be an end of dose effect, related to the half-life of the therapeutic agent. Reports in the published literature indicate discontinuation or wearing off of dopaminergic medications can result in rebound. The backing layer of NEUPRO contains aluminum. To avoid skin burns, NEUPRO should be removed prior to magnetic resonance imaging or cardioversion. The effect of application of heat to the transdermal system has not been studied. However, heat application has been shown to increase absorption several fold with other transdermal products. Patients should be advised to avoid exposing the NEUPRO application site to external sources of direct heat, such as heating pads or electric blankets, heat lamps, saunas, hot tubs, heated water beds, and prolonged direct sunlight. A symptom complex resembling the neuroleptic malignant syndrome (characterized by elevated temperature, muscular rigidity, altered consciousness, rhabdomyolysis, and/or autonomic instability), with no other obvious etiology, has been reported in association with rapid dose reduction, withdrawal of, or changes in anti-Parkinsonian therapy. Therefore, it is recommended that the dose be tapered at the end of NEUPRO treatment [see Dosage and Administration (2.4)]. As has been reported with other dopamine agonists, binding to melanin-containing tissues (i.e., eyes) in the pigmented rat and monkey was evident after a single dose of rotigotine, but was slowly cleared over the 14-day observation period. Because clinical trials are conducted under widely varying conditions, the incidence of adverse reactions (number of unique patients experiencing an adverse reaction associated with treatment/total number of patients treated) observed in the clinical trials of a drug cannot be directly compared to incidence of adverse reactions in the clinical trials of another drug and may not reflect the incidence of adverse reactions observed in practice. The safety of NEUPRO was evaluated in a total of 649 early-stage Parkinson's disease patients who participated in three double-blind, placebo-controlled studies with durations of 3 to 9 months. Additional safety information was collected in short-term studies and two open-label extension studies in patients with early-stage Parkinson's disease. In the double-blind, placebo-controlled, dose-response study in patients with early-stage Parkinson's disease, the most common adverse reactions (at least 5% greater than placebo) for the maximum recommended dose of NEUPRO (6 mg/24 hours) were nausea, vomiting, somnolence, application site reactions, dizziness, anorexia, disturbances in initiating and maintaining sleep, hyperhidrosis, and visual disturbance. In this trial, 12% of patients treated with the maximum recommended NEUPRO dose (6 mg/24 hours) discontinued treatment because of adverse reactions, compared with 6% of patients who received placebo. Table 1 summarizes the adverse reactions that occurred in greater than 2% of NEUPRO-treated patients and more frequent than in placebo-treated patients in a double-blind, placebo-controlled, fixed-dose trial in patients with early-stage Parkinson's disease. Incidences for the non-recommended 8 mg/24 hours dose are also shown. The incidence of certain adverse reactions with NEUPRO was notably increased compared to placebo treatment (i.e., at least 5% greater than placebo) in either the titration or maintenance phases of the dose-response trial. During the titration phase, this increased incidence of a treatment difference was observed for nausea, somnolence, vomiting, application site reactions (ASRs), dizziness, sweating increased, anorexia, and visual disturbance. During the maintenance phase, an increased incidence was observed for nausea and ASRs. Some adverse reactions developing in the titration phase persisted (at least 7 days) into the maintenance phase. These "persistent" adverse reactions included ASRs, anorexia, somnolence, and nausea. The safety evaluation of NEUPRO was based on a total of 672 NEUPRO-treated patients with advanced-stage Parkinson's disease who participated in three double-blind, placebo-controlled studies (two fixed-dose trials and one flexible-dose trial) with durations of 3 to 7 months. Patients received concomitant levodopa in these studies. Additional safety information was collected in earlier short-term studies and two open-label extension studies in patients with advanced-stage Parkinson's disease. In the dose-response, placebo-controlled trial for advanced-stage Parkinson's disease, the most common adverse reactions (at least 5% greater than placebo) for the maximum recommended dose of NEUPRO (8 mg/24 hours) were application site reactions, nausea, peripheral edema, dizziness, and dyskinesia. In this trial, approximately 15% of patients treated with the maximum recommended NEUPRO dose (8 mg/24 hours) discontinued treatment because of adverse reactions, compared with 9% of patients who received placebo. Table 2 summarizes the adverse reactions that occurred in greater than 2% of NEUPRO-treated patients and more frequent than in placebo-treated patients in a double-blind, placebo-controlled, fixed-dose trial in patients with advanced-stage Parkinson's disease. Incidences for the non-recommended 12 mg/24 hours dose are also shown. The incidence of certain adverse reactions with NEUPRO was notably increased compared to placebo treatment (i.e., at least 5% greater than placebo) in either the titration or maintenance phases of the dose-response trial. During the titration phase, an increased incidence was observed for application site reactions (ASRs), nausea, hallucinations, constipation, dyskinesia, and dizziness. During the maintenance phase, an increased incidence was observed for ASRs and peripheral edema. Some adverse reactions developing in the titration phase persisted (at least 7 days) into the maintenance phase. A notably "persistent" adverse reaction was ASRs. The safety evaluation of NEUPRO was based on 745 NEUPRO-treated patients with Restless Legs Syndrome who participated in two double-blind, placebo-controlled studies with maintenance durations of 6 months. Additional safety information was collected in earlier short-term studies and three open-label extension studies in patients with RLS. In the two double-blind, placebo-controlled, fixed-dose trials for RLS, the most common adverse reactions (at least 5% greater than placebo) for the maximum recommended dose of NEUPRO (3 mg/24 hours) were application site reactions, nausea, disturbances in initiating and maintaining sleep, somnolence, and headache. In the two fixed-dose, placebo-controlled trials, 24% of patients treated with the maximum recommended NEUPRO dose (3 mg/24 hours) discontinued treatment because of adverse reactions, compared with 3% of patients who received placebo. Table 3 summarizes the adverse reactions that occurred in at least 2% of NEUPRO-treated patients and more frequent than in placebo-treated patients in two double-blind, placebo-controlled, fixed-dose trials in patients with Restless Legs Syndrome. Asthenic conditions is a high-level term for the following preferred terms: asthenia, malaise, and fatigue. The incidence of certain adverse reactions with NEUPRO treatment was increased compared to placebo (i.e., at least 5% greater than placebo) in either the titration or maintenance phases of the dose-response trials. During the titration phase, an increased incidence was observed for application site reactions (ASRs), nausea, headache, asthenic conditions, and disturbances in initiating and maintaining sleep. During the maintenance phase, an increased incidence was observed for ASRs. Some adverse reactions developing in the titration phase persisted (at least 7 days) into the maintenance phase. These "persistent" adverse reactions were ASRs, nausea, and disturbances in initiating and maintaining sleep. Some clinical laboratory analytes were abnormal in patients treated with the maximum recommended NEUPRO dose in the fixed-dose, placebo-controlled, dose-response trials for patients with early- and advanced-stage Parkinson's disease and with RLS. Patients with early-stage Parkinson's disease receiving NEUPRO had an increased risk for low hemoglobin below the normal reference range (NEUPRO 8% vs. placebo 2%) and for decreased hematocrit below the normal reference range (NEUPRO 8% vs. placebo 5%). Patients with advanced-stage Parkinson's disease receiving NEUPRO had an increased risk for a low hemoglobin below the normal reference range (NEUPRO 15% vs. placebo 11%) and for decreased hematocrit below the normal reference range (NEUPRO 17% vs. placebo 14%). Patients with RLS receiving NEUPRO had an increased risk for a decreased hemoglobin below the normal reference range (NEUPRO 15% vs. placebo 12%). There was also an increased risk for markedly decreased hemoglobin and hematocrit (NEUPRO 2% vs. placebo 0%) in patients with advanced-stage Parkinson's disease receiving NEUPRO and for markedly decreased hematocrit (NEUPRO 1% vs. placebo 0%) in patients with RLS receiving NEUPRO. Patients with early-stage Parkinson's disease receiving NEUPRO had an increased risk for elevated serum blood urea nitrogen (BUN) above the normal reference range (NEUPRO 11% vs. placebo 2%). There was also an increased risk for markedly elevated serum BUN (NEUPRO 3% vs. placebo 2%) in patients with advanced-stage Parkinson's disease receiving NEUPRO. There was an increased risk for low serum glucose below the normal reference range in patients with early-stage Parkinson's disease receiving NEUPRO (NEUPRO 15% vs. placebo 6%) and in patients with advanced-stage Parkinson's disease (NEUPRO 10% vs. placebo 7%). There was also an increased risk for markedly decreased serum glucose (NEUPRO 1% vs. placebo 0%) in patients with advanced-stage Parkinson's disease receiving NEUPRO. Serum creatine phosphokinase (CPK) was elevated in Japanese patients taking NEUPRO for early- or advanced-stage Parkinson's disease in placebo-controlled, flexible-dose studies conducted in Japan. The frequency of CPK elevation observed in patients receiving NEUPRO for early-stage Parkinson's disease was 40% (35/88) in the NEUPRO group compared to 17% (15/89) in the placebo group. The frequency of CPK elevation observed in patients receiving NEUPRO for advanced-stage Parkinson's disease was 39% (99/253) in the NEUPRO group compared to 20% (34/171) in the placebo group using pooled data from two studies. Increased CPK occurred at any time during the respective studies, and in some instances increased CPK was observed at two or more consecutive visits. The total daily dose of NEUPRO taken by patients with early- and advanced-stage Parkinson's disease ranged between 2 mg/24 hours to 16 mg/24 hours. Studies of NEUPRO conducted outside of Japan did not include assessments of serum CPK in patients treated for Parkinson's disease. The following adverse reaction has been identified during post-approval use of NEUPRO. Because these reactions are reported voluntarily from a population of uncertain size, it is not always possible to reliably estimate their frequency or establish a causal relationship to drug exposure. Dopamine antagonists, such as antipsychotics or metoclopramide, may diminish the effectiveness of NEUPRO [see Clinical Pharmacology (12.3)]. There are no adequate data on the developmental risk associated with the use of NEUPRO in pregnant women. In animal studies, rotigotine was shown to have adverse effects on embryofetal development when administered during pregnancy at doses similar to or lower than those used clinically [see Data]. In the U.S. general population, the estimated background risk of major birth defects and of miscarriage in clinically recognized pregnancies is 2% to 4% and 15% to 20%, respectively. The background risk of major birth defects and miscarriage in the indicated population is unknown. Rotigotine administered subcutaneously (0, 10, 30, or 90 mg/kg/day) to pregnant mice during organogenesis (gestation days 6 through 15) resulted in increased incidences of delayed skeletal ossification and decreased fetal body weights at the two highest doses and an increase in embryofetal death at the high dose. The no-effect dose for embryofetal developmental toxicity in mice is approximately 6 times the maximum recommended human dose (MRHD) for Parkinson's disease (8 mg/24 hours) on a body surface area (mg/m2) basis. Rotigotine administered subcutaneously (0, 0.5, 1.5, or 5 mg/kg/day) to pregnant rats during organogenesis (gestation days 6 through 17) resulted in increased embryofetal death at all doses. The lowest effect dose is less than the MRHD on a mg/m2 basis. This effect in rats is thought to be due to the prolactin-lowering effect of rotigotine. When rotigotine was administered subcutaneously (0, 5, 10, or 30 mg/kg/day) to pregnant rabbits during organogenesis (gestation days 7 through 19), an increase in embryofetal death occurred at the two highest doses tested. The no-effect dose is 12 times the MRHD on a mg/m2 basis. In a study in which rotigotine was administered subcutaneously (0, 0.1, 0.3, or 1 mg/kg/day) to rats throughout pregnancy and lactation (gestation day 6 through postnatal day 21), impaired growth and development during lactation and long-term neurobehavioral abnormalities were observed in the offspring at the highest dose tested; when those offspring were mated, growth and survival of the next generation were adversely affected. The no-effect dose for pre- and postnatal developmental toxicity (0.3 mg/kg/day) is less than the MRHD on a mg/m2 basis. There are no data on the presence of rotigotine in human milk, the effects of rotigotine on the breastfed infant, or the effects of rotigotine on milk production. However, inhibition of lactation may occur because rotigotine decreases secretion of prolactin in humans. Studies have shown that rotigotine and/or its metabolite(s) are excreted in rat milk. The developmental and health benefits of breastfeeding should be considered along with the mother's clinical need for NEUPRO and any potential adverse effects on the breastfed infant from NEUPRO or from the underlying maternal condition. Safety and effectiveness in pediatric patients for any indication have not been established. Of patients receiving NEUPRO in clinical studies for the treatment of Parkinson's disease, approximately 50% were age 65 and over, and approximately 11% were age 75 and over. Among patients receiving NEUPRO in clinical studies for the treatment of RLS, 26% were age 65 and over. No overall differences in safety or effectiveness were observed between these patients and younger patients, and other reported clinical experience has not identified differences in responses between the elderly and younger patients, but greater sensitivity of some older individuals cannot be ruled out. No overall differences in plasma levels of rotigotine were observed between patients who were 65 to 80 years old compared with younger patients receiving the same rotigotine doses. The most likely symptoms of overdose would be those related to the pharmacodynamic profile of a dopamine agonist, including nausea, vomiting, hypotension, involuntary movements, hallucinations, confusion, convulsions, and other signs of excessive dopaminergic stimulation. There is no known antidote for overdosage of dopamine agonists. 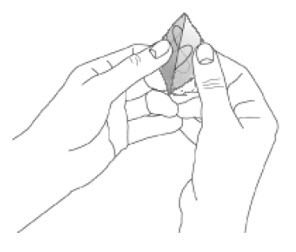 In case of suspected overdose, the excess transdermal system(s) should immediately be removed from the patient. Concentrations of rotigotine decrease after patch removal. The terminal half-life of rotigotine is 5 to 7 hours. The pharmacokinetic profile showed a biphasic elimination with an initial half-life of 3 hours. The patient's heart rate, heart rhythm, and blood pressure should be monitored. As shown in a study of renally impaired patients, dialysis is not expected to be beneficial. Treatment of overdose may require general supportive measures to maintain vital signs. If it is necessary to discontinue use of rotigotine after overdose, it should be discontinued gradually to prevent hyperpyrexia and confusion [see Dosage and Administration (2.4) and Warnings and Precautions (5.15)]. NEUPRO is a transdermal system that provides continuous delivery of rotigotine, a non-ergoline dopamine agonist, for 24 hours following application to intact skin. NEUPRO is available in six strengths as shown in Table 4. The asterisk designates the chiral center. 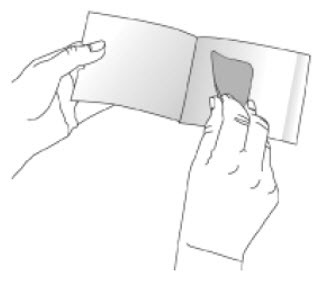 A flexible, tan-colored backing film, consisting of an aluminized polyester film coated with a pigment-layer on the outer side. The backing provides structural support and protection of the drug-loaded adhesive layer from the environment. 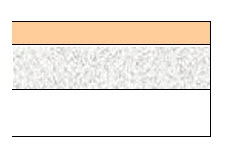 A self-adhesive drug matrix layer, consisting of the active component rotigotine and the following inactive components: ascorbyl palmitate, povidone, silicone adhesive, sodium metabisulfite, and dl-alpha-tocopherol. A protective liner, consisting of a transparent fluoropolymer-coated polyester film. This liner protects the adhesive layer during storage and is removed just prior to application. 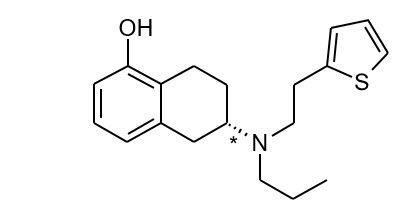 Rotigotine is a non-ergoline dopamine agonist. The precise mechanism of action of rotigotine as a treatment for Parkinson's disease is unknown, although it is thought to be related to its ability to stimulate dopamine receptors within the caudate-putamen in the brain. The precise mechanism of action of rotigotine as a treatment for Restless Legs Syndrome is unknown but is thought to be related to its ability to stimulate dopamine receptors. There is no indication of a QT/QTc prolonging effect of NEUPRO in doses up to 24 mg/24 hours. The effects of NEUPRO at doses up to 24 mg/24 hours (supratherapeutic doses) on the QT/QTc interval was evaluated in a double-blind, randomized, placebo- and positive-controlled (moxifloxacin 400 mg IV, single dose), parallel-group trial with an overall treatment period of 52 days in male and female patients with advanced-stage Parkinson's disease. Assay sensitivity was confirmed by significant QTc prolongation by moxifloxacin. On average, approximately 45% of the rotigotine from the patch is released within 24 hours (0.2 mg/cm2). Rotigotine is primarily eliminated in the urine as inactive conjugates. After removal of the patch, plasma levels decreased with a terminal half-life of 5 to 7 hours. The pharmacokinetic profile showed a biphasic elimination with an initial half-life of 3 hours. When single doses of 8 mg/24 hours are applied to the trunk, there is an average lag time of approximately 3 hours until drug is detected in plasma (range 1 to 8 hours). Tmax typically occurs between 15 to 18 hours post dose but can occur from 4 to 27 hours post dose. However, there is no characteristic peak concentration observed. Rotigotine displays dose-proportionality over a daily dose range of 1 mg/24 hours to 24 mg/24 hours. In the clinical studies of rotigotine effectiveness, the transdermal system application site was rotated from day to day (abdomen, thigh, hip, flank, shoulder, or upper arm) and the mean measured plasma concentrations of rotigotine were stable over the 6 months of maintenance treatment. Relative bioavailability for the different application sites at steady-state was evaluated in subjects with Parkinson's disease. In a single trial conducted in patients with early-stage Parkinson's disease, differences in bioavailability ranged from less than 1% (abdomen vs. hip) to 46% (shoulder vs. thigh) with shoulder application showing higher bioavailability. Because rotigotine is administered transdermally, food should not affect absorption. In a 14-day clinical study with rotigotine administered to healthy subjects, steady-state plasma concentrations were achieved within 2 to 3 days of daily dosing. Average NEUPRO plasma concentrations (±95% CI) in patients with early-stage Parkinson's disease are shown in Figure 2 after application of a 8 mg/24 hours transdermal system to 1 of 6 application sites (shoulder, upper arm, flank, hip, abdomen, or thigh) on 2 different days during the maintenance phase. The weight normalized apparent volume of distribution (Vd/F) in humans is approximately 84 L/kg after repeated dose administration. The binding of rotigotine to human plasma proteins is approximately 92% in vitro and 89.5% in vivo. Rotigotine is extensively metabolized by conjugation and N-dealkylation. After intravenous dosing the predominant metabolites in human plasma are sulfate conjugates of rotigotine, glucuronide conjugates of rotigotine, sulfate conjugates of the N-despropyl-rotigotine and conjugates of N-desthienylethyl-rotigotine. Multiple CYP isoenzymes, sulfotransferases and two UDP-glucuronosyltransferases catalyze the metabolism of rotigotine. After removal of the patch, plasma levels decreased with a terminal half-life of 5 to 7 hours. The pharmacokinetic profile showed a biphasic elimination with an initial half-life of 3 hours. Rotigotine is primarily excreted in urine (approximately 71%) as inactive conjugates of the parent compound and N-desalkyl metabolites. A smaller proportion is excreted in feces (approximately 23%). The major metabolites found in urine were rotigotine sulfate (16% to 22% of the absorbed dose), rotigotine glucuronide (11% to 15%), and N-despropyl-rotigotine sulfate metabolite (14% to 20%) and N-desthienylethyl-rotigotine sulfate metabolite (10% to 21%). Approximately 11% is renally eliminated as other metabolites. A small amount of unconjugated rotigotine is renally eliminated (less than 1% of the absorbed dose). In vitro studies indicate that multiple CYP-isoforms are capable of catalyzing the metabolism of rotigotine. In human liver microsomes, no extensive inhibition of the metabolism of rotigotine was observed when co-incubated with CYP isoform specific inhibitors. If an individual CYP isoform is inhibited, other isoforms can catalyze rotigotine metabolism. Rotigotine, the 5-O-glucuronide and its desalkyl and monohydroxy metabolites were analyzed for interactions with the human CYP isoenzymes CYP1A2, CYP2C9, CYP2C19, CYP2D6, and CYP3A4 in vitro. Based on these results, no risk for inhibition of CYP1A2, CYP2C9, and CYP3A4 catalyzed metabolism of other drugs is predicted at therapeutic rotigotine concentrations. There is a low risk of inhibition of CYP2C19 and CYP2D6 catalyzed metabolism of other drugs at therapeutic concentrations. In human hepatocytes in vitro, there was no indication for induction of CYP1A2, CYP2B6, CYP2C9, CYP2C19, and CYP3A4. Rotigotine is metabolized by multiple sulfotransferases and two UDP-glucuronosyltransferases (UGT1A9 and UGT2B15). These multiple pathways make it unlikely that inhibition of any one pathway would alter rotigotine concentrations significantly. In vitro, no potential for displacement of warfarin by rotigotine (and vice versa) from their respective human serum albumin binding sites was detected. The effect of rotigotine on the pharmacokinetics of digoxin has been investigated in vitro in Caco-2 cells. Rotigotine did not influence the P-glycoprotein-mediated transport of digoxin. Therefore, rotigotine would not be expected to affect the pharmacokinetics of digoxin. Co-administration of rotigotine (up to 4 mg/24 hours) with cimetidine (400 mg twice daily), an inhibitor of CYP1A2, CYP2C19, CYP2D6, and CYP3A4, did not alter the steady-state pharmacokinetics of rotigotine in healthy subjects. Co-administration of levodopa/carbidopa (100/25 mg twice daily) with rotigotine (4 mg/24 hours) had no effect on the steady-state pharmacokinetics of rotigotine; rotigotine had no effect on the pharmacokinetics of levodopa/carbidopa. Co-administration of rotigotine (3 mg/24 hours) did not affect the pharmacodynamics and pharmacokinetics of oral contraceptives (0.03 mg ethinylestradiol, 0.15 mg levonorgestrel). 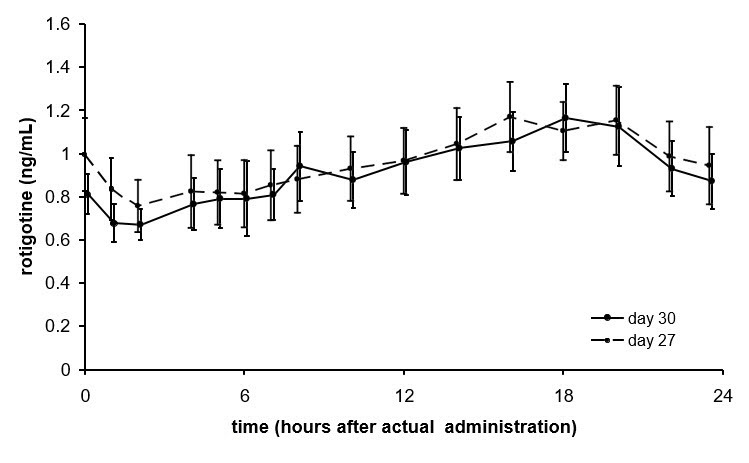 Co-administration of the CYP2C19 selective inhibitor omeprazole (40 mg/day) had no effect on the steady-state pharmacokinetics of rotigotine (4 mg/24 hours). The effect of impaired hepatic function on the pharmacokinetics of rotigotine has been studied in subjects with moderate hepatic impairment (Child-Pugh classification – Grade B). There were no relevant changes in rotigotine plasma concentrations. No information is available on subjects with severe impairment of hepatic function. The effect of renal function on rotigotine pharmacokinetics has been studied in subjects with mild to severe impairment of renal function including subjects requiring dialysis compared to healthy subjects. There were no relevant changes in rotigotine plasma concentrations (up to end-stage renal disease requiring hemodialysis). In subjects with severe renal impairment not on dialysis (i.e., creatinine clearance 15 to less than 30 ml/min), exposure to conjugated rotigotine metabolites was doubled. Female and male subjects and patients had similar plasma concentrations (body weight normalized). Plasma concentrations of rotigotine in patients 65 to 80 years of age were similar to those in younger patients, approximately 40 to 64 years of age. Although not studied, exposures in older subjects (more than 80 years) may be higher due to skin changes with aging. The pharmacokinetics of rotigotine in subjects below the age of 18 years has not been established. The pharmacokinetic profile was similar in Caucasians, Blacks, and Japanese. Adhesion was examined in subjects with Parkinson's disease when patches were applied to rotating sites. Similar results were observed for the 4 mg/24 hours (20 cm2), 6 mg/24 hours (30 cm2), and 8 mg/24 hours (40 cm2) patches. An adherence of 90% or more of the patch surface was observed in 71% to 82% of cases. A partial detachment of more than 10% was observed in 15% to 24% of cases. A complete detachment of the patch was observed in 3% to 5% of cases. Two-year carcinogenicity studies of rotigotine were conducted in mice at doses of 0, 3, 10, and 30 mg/kg and in rats at doses of 0, 0.3, 1, and 3 mg/kg; in both studies rotigotine was administered subcutaneously once every 48 hours. No significant increases in tumors occurred in mice at doses up to 9 times the maximum recommended human dose (MRHD) in Parkinson's disease (8 mg/24 hours). In rats, there were increases in Leydig cell tumors and in uterine tumors (adenocarcinomas, squamous cell carcinomas) at all doses. The endocrine mechanisms believed to be involved in the production of these tumors in rats are not considered relevant to humans. Therefore, there were no tumor findings considered relevant to humans at plasma exposures (AUC) up to 4 to 6 times that in humans at the MRHD. Rotigotine was negative in the in vitro bacterial reverse mutation (Ames) and in the in vivo micronucleus assays. Rotigotine was mutagenic and clastogenic in the in vivo mouse lymphoma tk assay. When rotigotine was administered subcutaneously (0, 1.5, 5, or 15 mg/kg/day) to female rats prior to and during mating and continuing through gestation day 7, an absence of implantation was observed at all doses. The lowest dose tested is 2 times the MRHD on a mg/m2 basis. In male rats treated from 70 days prior to and during mating, there was no effect on fertility; however, a decrease in epididymal sperm motility was observed at the highest dose tested. The no-effect dose (5 mg/kg/day) is 6 times the MRHD on a mg/m2 basis. When rotigotine was administered subcutaneously to female mice at doses of 0, 10, 30, and 90 mg/kg/day from 2 weeks until 4 days before mating and then at a dose of 6 mg/kg/day (all groups) (approximately 4 times the MRHD on a mg/m2 basis) from 3 days before mating until gestation day 7, a markedly reduced (low dose) or complete absence of implantation (mid and high doses) was observed. The effects on implantation in rodents are thought to be due to the prolactin-lowering effect of rotigotine. In humans, chorionic gonadotropin, not prolactin, is essential for implantation. Retinal degeneration was observed in albino rats in a 6-month toxicity study at the highest dose of rotigotine (plasma exposure [AUC] at least 15 times that in humans at the MRHD). Retinal degeneration was not observed in the 2-year carcinogenicity studies in albino rat (plasma AUCs up to 4-6 times that in humans at the MRHD) or albino mouse, or in monkeys treated for 1 year. The potential significance of this effect in humans has not been established, but cannot be disregarded because disruption of a mechanism that is universally present in vertebrates (i.e., disk shedding) may be involved. The effectiveness of NEUPRO in the treatment of the signs and symptoms of idiopathic Parkinson's disease was established in five parallel-group, randomized, double-blind, placebo-controlled trials conducted in the U.S. and abroad. Three of these five trials enrolled patients with early-stage Parkinson's disease (not receiving levodopa), and two enrolled patients with advanced-stage Parkinson's disease who were receiving levodopa. Depending on trial design, patients underwent a weekly titration of NEUPRO in 2 mg/24 hours increments to either the randomized dose or optimal dose. Back titrations by 2 mg/24 hours decrement of NEUPRO were permitted for intolerable adverse events. Patch application sites were changed on a daily basis. Change from baseline in the Unified Parkinson's Disease Rating Scale (UPDRS), Parts II + III, served as the primary outcome assessment measure in the early-stage studies. The UPDRS is a four-part multi-item rating scale intended to evaluate mentation (Part I), Activities of Daily Living (ADL) (Part II), motor performance (Part III), and complications of therapy (Part IV). Part II of the UPDRS contains 13 questions relating to ADL, which are scored from 0 (normal) to 4 (maximal severity) for a maximum (worst) score of 52. Part III of the UPDRS contains 27 questions (for 14 items) and is scored as described for Part II. Part III is designed to assess the severity of the cardinal motor findings in patients with Parkinson's disease (e.g., tremor, rigidity, bradykinesia, postural instability, etc. ), scored for different body regions, and has a maximum (worst) score of 108. Change from baseline in time spent "off" (hours) based on daily diaries was the primary outcome assessment in the two trials of advanced-stage Parkinson's disease (with levodopa). Patients (N=649) in the three trials of early-stage Parkinson's disease had limited or no prior exposure to levodopa (off levodopa for at least 28 days prior to baseline or levodopa use for no more than 6 months). Patients were excluded from the studies if they had a history of pallidotomy, thalamotomy, deep brain stimulation, or fetal tissue transplant. Patients receiving selegiline, anticholinergic agents, or amantadine must have been on a stable dose and able to maintain that dose for the duration of the study. This trial was a multicenter, multinational, dose-response study in which 316 early-stage Parkinson's disease patients were titrated over 4 weeks to their randomized treatment with either placebo or one of four fixed doses of NEUPRO (2 mg/24 hours, 4 mg/24 hours, 6 mg/24 hours, or 8 mg/24 hours). The patches were applied to the upper abdomen and the sites of application were rotated on a daily basis. Patients underwent a weekly titration (increasing the number of 2 mg/24 hours patches or placebo patches at weekly intervals) over 4 weeks such that the target doses of NEUPRO were achieved for all groups by the end of 3 weeks and were administered over the fourth week of the titration phase. Patients then continued on treatment for a 7-week maintenance phase followed by a down titration during the last week. Two back titrations by a single patch (i.e., 2 mg/24 hours decrement of NEUPRO or placebo) at a time were permitted for intolerable adverse events. The mean age of patients was approximately 60 years (range 33-83 years; approximately 36% were 65 years or older) and the study enrolled more men (62%) than women (39%). Most patients (85%) were Caucasian and most randomized patients (≥88%) completed the full treatment period. Mean baseline combined UPDRS (Parts II + III) scores were similar among all treatment groups, between 27.1 and 28.5 for all groups. The mean change from baseline and difference from placebo for each treatment group is shown in Table 5. Statistically significant mean changes reflecting dose-related improvement were observed at the three highest doses, and the 6 mg/24 hours and 8 mg/24 hours doses had a similar effect. This trial was a multinational, randomized, double-blind, flexible NEUPRO dose (2 mg/24 hours, 4 mg/24 hours, or 6 mg/24 hours), parallel-group study in which 277 early-stage Parkinson's disease patients were assigned (2: 1 ratio) to treatment with NEUPRO or placebo for a period up to about 28 weeks. This trial was conducted in 47 sites in North America (U.S. and Canada). Patches were applied to different body parts including upper or lower abdomen, thigh, hip, flank, shoulder, and/or upper arm and patch application sites were to be rotated on a daily basis. Patients underwent a weekly titration (consisting of 2 mg/24 hours increments at weekly intervals) over 3 weeks to a maximal dose of 6 mg/24 hours depending on efficacy and tolerability, and then received treatment over a 24-week maintenance phase followed by a de-escalation over a period up to 4 days. Back/down titration by a single patch (i.e., 2 mg/24 hours decrement of NEUPRO or placebo) was permitted during the titration phase for intolerable adverse events but was not permitted during the maintenance phase (i.e., patients with intolerable adverse events had to leave the study). Primary efficacy data were collected after a treatment period of up to approximately 27 weeks. The mean age of patients was approximately 63 years (range 32-86 years; approximately 45% were 65 years or older), approximately two-thirds of all patients were men, and nearly all patients were Caucasian. Approximately 90% of patients randomized to NEUPRO achieved a maximal daily dose of 6 mg/24 hours; 70% maintained this dose for most (more than 20 weeks) of the maintenance phase. Most enrolled patients (≥81%) completed the full treatment period. Mean baseline combined UPDRS (Parts II + III) was similar in both groups (29.9 NEUPRO group, 30.0 placebo). NEUPRO-treated patients experienced a mean change in the combined UPDRS (Parts II + III) from baseline to end of treatment (end of treatment week 27 or last visit for patients discontinuing early) of -4.0 (Table 6), and the difference from placebo was statistically significant. This study was a multinational, randomized, double-blind, flexible-dose (NEUPRO 2 mg/24 hours, 4 mg/24 hours, 6 mg/24 hours, or 8 mg/24 hours), three-arm, parallel-group study using a double-dummy treatment in which 561 early-stage Parkinson's disease patients were assigned to treatment with either placebo or NEUPRO or active oral comparator in a ratio of 1: 2: 2 for a period up to about 39 weeks. This study was conducted in up to 81 sites in many countries outside of North America. Patches were applied to different body parts including upper or lower abdomen, thigh, hip, flank, shoulder, and/or upper arm and patch application sites were to be rotated on a daily basis. Treatment with a patch and placebo was given to all patients in a double-blinded manner such that no one would know the actual treatment (i.e., NEUPRO, comparator, or placebo). Patients underwent a weekly dose escalation/titration of patch (consisting of 2 mg/24 hours increments of NEUPRO or placebo) and a dose escalation of capsules of comparator or placebo over 13 weeks (13-week titration was planned for the comparator treatment) up to a maximal dose of 8 mg/24 hours of NEUPRO depending on achieving optimal efficacy or intolerability at a lower dose. Patients randomized to NEUPRO achieved the maximal dose of 8 mg/24 hours after a 4-week titration if maximal efficacy and intolerability had not occurred over a 4-week titration period. Patients then received treatment over a 24-week maintenance phase followed by a de-escalation over a period up to 12 days. A single back titration by a single patch (i.e., 2 mg/24 hours decrement of NEUPRO or placebo) or capsule was permitted during the titration phase for intolerable adverse events but was not permitted during the maintenance phase (i.e., patients with intolerable adverse events had to discontinue from this study). Primary efficacy data were collected after a treatment period of up to approximately 37 weeks of randomized treatment. The mean age of patients was approximately 61 years (range 30-86 years; approximately 41% were 65 years or older), nearly 60% of all patients were men, and nearly all patients were Caucasian. About 73% of patients completed the full treatment period. The mean daily dose of NEUPRO was just less than 8 mg/24 hours and approximately 90% of patients achieved the maximal daily dose of 8 mg/24 hours. Mean baseline combined UPDRS (Parts II + III) was similar across all groups (33.2 NEUPRO, 31.3 placebo, 32.2 comparator). NEUPRO-treated patients experienced a mean change in the combined UPDRS (Parts II + III) from baseline to end of treatment (end of treatment week 37 or last visit for patients discontinuing early) of -6.8, and the difference from placebo-treated patients showed a mean change from baseline of -2.3 (see Table 7), a difference that was statistically significant. Patients (N=658) in the three trials of NEUPRO in advanced-stage Parkinson's disease had to be experiencing "on-off" periods at baseline, despite treatment with optimal doses of levodopa. Patients continued concomitant levodopa during the trial; however, reductions in the dosage of levodopa were allowed if patients experienced adverse events that the investigator considered related to dopaminergic therapy. Patients were excluded from the studies if they had a history of pallidotomy, thalamotomy, deep brain stimulation, or fetal tissue transplant. Patients receiving selegiline, anticholinergic agents, or amantadine must have been on a stable dose and able to maintain that dose for the duration of the study. In the North American trial, COMT-inhibitors were not permitted. This trial was a multinational, three-arm, parallel-group study in which 351 advanced-stage Parkinson's disease patients were titrated over 5 weeks to treatment with either placebo or NEUPRO (8 mg/24 hours or 12 mg/24 hours) and maintained treatment for 24 weeks followed by a down titration over the last week. This study was conducted in 55 sites in North America (U.S. and Canada). Mean baseline "off" times were similar among all treatment groups (6.4, 6.8, and 6.3 hours for the placebo, NEUPRO 8 mg/24 hours and 12 mg/24 hours treatment groups, respectively). NEUPRO-treated patients experienced a mean change in "off" time from baseline to end of treatment of -2.7 hours for the 8 mg/24 hours treatment arm and -2.1 hours for the 12 mg/24 hours treatment arm (Table 8), and the difference from placebo was statistically significant for both NEUPRO doses (8 mg/24 hours, 12 mg/24 hours). Onset of treatment benefit began as early as the first week of treatment. This trial was a multinational, flexible-dose, three-arm, parallel-group study using a double-dummy treatment in which 506 advanced-stage Parkinson's disease patients were titrated over 7 weeks to treatment with either NEUPRO from a minimum dose of 4 mg/24 hours up to an optimal dose not exceeding 16 mg/24 hours, active oral comparator, or placebo and maintained treatment for 16 weeks followed by a down titration over 6 days. This study was conducted in 77 sites in many countries outside of North America. Mean baseline "off" times were similar among all treatment groups (6.6, 6.2, and 6.0 hours for the placebo, NEUPRO, and comparator treatment groups, respectively). NEUPRO-treated patients experienced a mean 2.5 hour decrease change in "off" time from baseline to end of treatment (Table 9), and the difference from placebo was statistically significant. Onset of treatment benefit began as early as the first week of treatment. The optimal NEUPRO dose was established as 4 mg/24 hours for 2% of patients, 6 mg/24 hours for 6%, 8 mg/24 hours for 8%, 10 mg/24 hours for 9%, 12 mg/24 hours for 16%, 14 mg/24 hours for 11% and 16 mg/24 hours for 44%. The clinical program included 1309 patients with moderate-to-severe RLS. The efficacy of NEUPRO in the treatment of Restless Legs Syndrome (RLS) was primarily evaluated in two randomized, double-blind, placebo-controlled, fixed-dose trials with maintenance periods of 6 months duration. Patients received NEUPRO doses ranging from 0.5 mg/24 hours to 3 mg/24 hours or placebo once daily. In these two trials, the mean duration of RLS was 2.1 to 3.1 years, mean age was approximately 55 years (range 19-78 years), approximately 68% were women, and 97% were Caucasian. In both trials, patches were applied to different application sites including the abdomen, thigh, hip, flank, shoulder, and/or upper arm and patch application sites were rotated on a daily basis. The two outcome measures used to assess the effect of treatment as co-primary efficacy endpoints were the International RLS Rating Scale (IRLS Scale) and a Clinical Global Impression - Improvement (CGI-I) assessment. The IRLS Scale contains 10 items designed to assess the severity of sensory and motor symptoms, sleep disturbance, daytime somnolence, and impact on activities of daily living and mood associated with RLS. The range of scores is 0 to 40, with 0 being absence of RLS symptoms and 40 the most severe symptoms. The CGI-I is designed to assess clinical progress (global improvement) on a 7-point scale. This trial was a multicenter, five-arm, parallel-group, fixed-dose trial of NEUPRO in subjects with moderate-to-severe RLS. A total of 505 subjects were randomized in this trial, participating at approximately 50 sites in the U.S. Subjects received placebo or NEUPRO (0.5 mg/24 hours, 1 mg/24 hours, 2 mg/24 hours, 3 mg/24 hours). Subjects began treatment at a daily dosage of 0.5 mg/24 hours NEUPRO and were titrated over a 4-week period to their assigned daily dose followed by a 6-month maintenance period and 7-day down titration period. Mean baseline IRLS sum score were similar among all treatment groups (23.5, 23.1, 23.2, 23.3, and 23.6 for the placebo, NEUPRO 0.5 mg/24 hours, 1 mg/24 hours, 2 mg/24 hours, and 3 mg/24 hours groups, respectively). Patients experienced a mean change in the IRLS sum score from baseline to the end of treatment for each of the four NEUPRO dose groups. The mean changes from baseline and differences from placebo in IRLS sum score and CGI Item 1 are shown for each treatment group in Table 10. The difference between the two highest treatment groups (2 mg/24 hours and 3 mg/24 hours) and placebo were statistically significant. Of the NEUPRO-treated patients, 23% had an IRLS score of 0 compared to 9.1% of placebo patients at the end of the maintenance period. Onset of treatment benefit was seen with the 1 mg/24 hours dose. This trial was a multicenter, four-arm, parallel-group trial of NEUPRO in subjects with moderate-to-severe RLS. A total of 458 subjects were randomized in this trial, participating at approximately 50 sites in 8 European countries. Patients received placebo or NEUPRO (1 mg/24 hours, 2 mg/24 hours, 3 mg/24 hours). Patients began treatment at a daily dosage of 1 mg/24 hours NEUPRO and were titrated over a 3-week period to their assigned daily dose followed by a 6-month maintenance period and 7-day down-titration period. Mean baseline IRLS sum score were similar among all treatment groups (28.1, 28.1, 28.2, and 28.0 for the placebo, NEUPRO 1 mg/24 hours, 2 mg/24 hours, and 3 mg/24 hours groups, respectively). Patients experienced a mean change in the IRLS sum score from baseline to the end of treatment for each of the three NEUPRO dose groups. The mean changes from baseline and differences from placebo in IRLS sum score and CGI Item 1 are shown for each treatment group in Table 11. The difference between all three treatment groups (1 mg/24 hours, 2 mg/24 hours, and 3 mg/24 hours) and placebo were statistically significant. Of the NEUPRO-treated patients, 24% had an IRLS score of 0 compared to 12% of placebo patients at the end of the maintenance period. Onset of treatment benefit was seen with the 1 mg/24 hours dose. Each transdermal system is packaged in a separate pouch. Each strength is available in cartons of 30 transdermal systems. NEUPRO should be stored in the original pouch. Do not store outside of pouch. Apply the transdermal system immediately upon removal from the pouch. Discard used systems in household trash in a manner that prevents accidental application or ingestion by children, pets, or others. Advise patients about potential for sulfite sensitivity. NEUPRO contains sodium metabisulfite, which may cause allergic-type reactions including anaphylactic symptoms and life-threatening or less severe asthmatic episodes in certain susceptible people. An allergy to sulfites is not the same as an allergy to sulfa [see Warnings and Precautions (5.1)]. Advise and alert patients about the potential for sedating effects associated with NEUPRO, including somnolence and particularly to the possibility of falling asleep while engaged in activities of daily living. Because somnolence can be a frequent adverse reaction with potentially serious consequences, patients should neither drive a car nor engage in other potentially dangerous activities until they have gained sufficient experience with NEUPRO to gauge whether or not it affects their mental and/or motor performance adversely. Advise patients that if increased somnolence or new episodes of falling asleep during activities of daily living (e.g., watching television, passenger in a car, etc.) are experienced at any time during treatment, they should not drive or participate in potentially dangerous activities until they have contacted their physician. Patients should not drive, operate machinery, or work at heights during treatment if they have previously experienced somnolence and/or have fallen asleep without warning prior to use of NEUPRO. Because of the possible additive effects, caution should also be used when patients are taking alcohol, sedating medications, or other CNS depressants (e.g., benzodiazepines, antipsychotics, antidepressants, etc.) in combination with NEUPRO [see Warnings and Precautions (5.2)]. Inform patients that hallucinations and other symptoms of psychosis can occur while taking NEUPRO and that the elderly are at a higher risk than younger patients with Parkinson's disease [see Warnings and Precautions (5.3)]. Advise patients that they may develop symptomatic (or asymptomatic) hypotension while taking NEUPRO. Hypotension may occur more frequently during initial therapy. Accordingly, caution patients against rising rapidly after sitting or lying down, especially if they have been doing so for prolonged periods and especially at the initiation of treatment with NEUPRO [see Warnings and Precautions (5.4)]. Advise patients about the potential for syncope in patients using dopamine agonists. For this reason, alert patients to the possibility of syncope while taking NEUPRO [see Warnings and Precautions (5.5)]. Advise patients that they may experience impulse control and/or compulsive behaviors while taking one or more of the medications generally used for the treatment of Parkinson's disease, including NEUPRO. Ask patients about the development of new or increased gambling urges, sexual urges, or other urges while being treated with NEUPRO. Advise patients to inform their physician if they experience new or increased gambling urges, increased sexual urges, or other intense urges while taking NEUPRO [see Warnings and Precautions (5.6)]. Advise patients that NEUPRO can increase blood pressure and heart rate [see Warnings and Precautions (5.7)]. Advise patients that NEUPRO can cause increased weight and fluid retention [see Warnings and Precautions (5.8)]. Inform patients that NEUPRO may cause or exacerbate pre-existing dyskinesia [see Warnings and Precautions (5.9)]. Inform patients that application site reactions can occur and that the NEUPRO transdermal system application site should be rotated on a daily basis. NEUPRO should not be applied to the same application site more than once every 14 days. Advise patients to report persistent application site reaction (of more than a few days), increases in severity, or skin reactions that spread outside the application site to their physician [see Warnings and Precautions (5.10)]. If there is a skin rash or irritation from the transdermal system, direct sunlight on the area should be avoided until the skin heals. Exposure could lead to changes in the skin color. Inform patients that NEUPRO may cause RLS symptoms to have an earlier onset during the day or become worse [see Warnings and Precautions (5.11)]. Inform patients to remove NEUPRO before undergoing magnetic resonance imaging (MRI) or cardioversion. These procedures could cause a burn to the site where NEUPRO is applied [see Warnings and Precautions (5.12)]. Advise patients about the potential for heat application to increase drug absorption. Because applying external heat (e.g., a heating pad, sauna, or hot bath) to the transdermal system may increase the amount of drug absorbed, instruct patients to avoid applying heating pads or other sources of heat to the area of the transdermal system. Direct sun exposure of the transdermal system should also be avoided [see Warnings and Precautions (5.13)]. Inform patients that NEUPRO causes nausea, vomiting, and general gastrointestinal distress (i.e., dyspepsia/abdominal discomfort). Nausea and vomiting may occur more frequently during initial therapy and may require dose adjustment. Because the teratogenic potential of rotigotine has not been completely established in laboratory animals, and because experience in humans is limited, advise women to notify their physicians if they become pregnant or intend to become pregnant during therapy [see Use in Specific Populations (8.1)]. Because of the possibility that rotigotine may be excreted in breast milk, advise women to notify their physicians if they intend to breastfeed or are breastfeeding an infant [see Use in Specific Populations (8.2)]. Instruct patients to wear NEUPRO continuously for 24 hours. After 24 hours, the patch should be removed and a new one applied immediately. Patients can choose the most convenient time of day or night to apply NEUPRO but should be advised to apply the patch at approximately the same time each day. If a patient forgets to change a patch, a new patch should be applied as soon as possible and replaced at the usual time the following day. Advise patients that they should only discontinue use of NEUPRO under the supervision of a healthcare professional to reduce the risk for hyperpyrexia and confusion associated with sudden discontinuation or dose reduction. 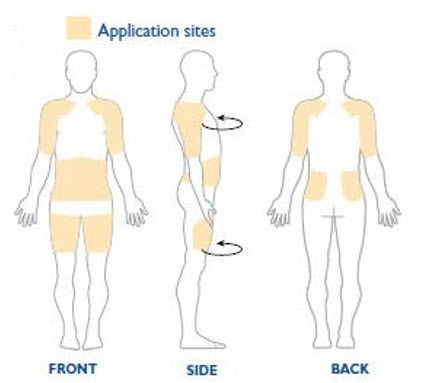 The application site for NEUPRO should be moved on a daily basis (for example, from the right side to the left side and from the upper body to the lower body). NEUPRO should not be applied to the same application site more than once every 14 days. NEUPRO should be applied immediately after opening the pouch and removing the protective liner. 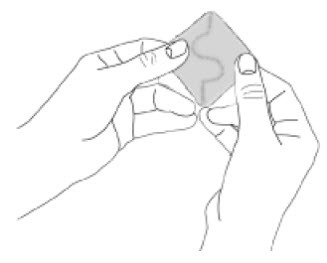 The system should be pressed firmly in place for 30 seconds, making sure there is good contact, especially around the edges. NEUPRO should be applied once daily to clean, dry, and intact skin on the abdomen, thigh, hip, flank, shoulder, or upper arm. Shave hairy areas at least 3 days prior to applying the patch. Do not apply to areas that could be rubbed by tight clothing, or under a waistband, to skin folds, or to skin that is red or irritated. Creams, lotions, ointments, oils, and powders should not be applied to the skin area where NEUPRO will be placed. Patients should wash their hands to remove any drug and should be careful not to touch their eyes or any objects [see Dosage and Administration (2)]. Instruct patients not to cut or damage NEUPRO. Care should be used to avoid dislodging the patch while showering, bathing or during physical activity. If the edges of the patch lift, NEUPRO may be taped down with bandage tape. If the patch detaches, a new one may be applied immediately to a different site. The patient should then change the patch according to their regular schedule. NEUPRO should always be removed slowly and carefully to avoid irritation. 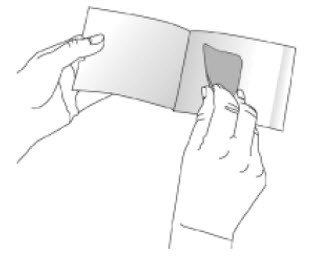 After removal, the patch should be folded over so that it sticks to itself and should be discarded so that children and pets cannot reach it. Wash the site with soap and water to remove any drug or adhesive. Baby or mineral oil may be used to remove any excess residue. Alcohol and other solvents (such as nail polish remover) may cause skin irritation and should not be used. Neupro® is a registered trademark of the UCB Group of Companies. If you have Parkinson's disease, read this side. If you have Restless Legs Syndrome (also known as Willis-Ekbom disease), read the other side. IMPORTANT: NEUPRO is for use on the skin only. NEUPRO is a prescription medicine used to treat Parkinson's disease (PD). NEUPRO is a patch worn on the skin. It is not known if NEUPRO is safe and effective in children. Do not use NEUPRO if you are allergic to rotigotine or any of the ingredients in NEUPRO. See the end of this leaflet for a complete list of ingredients in NEUPRO. What should I tell my doctor before using NEUPRO? have breathing problems including asthma. have mental problems such as schizophrenia, bipolar disorder, or psychosis. drink alcoholic beverages. This may increase your chances of becoming drowsy or sleepy while using NEUPRO. are pregnant or plan to become pregnant. It is not known if NEUPRO will harm your unborn baby. are breastfeeding or plan to breastfeed. It is not known if NEUPRO passes into your breastmilk. The amount of breast milk you make may be decreased while taking NEUPRO. Talk to your doctor about the best way to feed your baby if you take NEUPRO. NEUPRO and other medicines may affect each other causing side effects. NEUPRO may affect the way other medicines work, and other medicines may affect how NEUPRO works. Especially tell your doctor if you take other medicines that can make you sleepy such as sleep medicines, antidepressants, or antipsychotics. How should I use NEUPRO for Parkinson's disease? 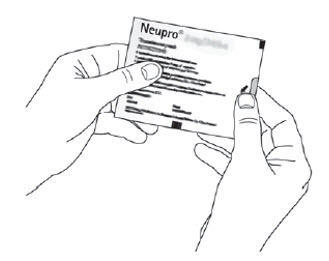 Read the Instructions for Use at the end of this leaflet for specific information about the right way to apply the NEUPRO patch. Use NEUPRO exactly as your doctor tells you to use it. NEUPRO comes in 4 different size (dose) patches for Parkinson's disease. Your doctor should start you on a low dose of NEUPRO. Your doctor will change the dose weekly until you are taking the right amount of medicine to control your symptoms. It may take several weeks before you reach the dose that controls your symptoms best. Apply NEUPRO 1 time each day at the same time each day. You may bathe, shower, or swim while wearing a NEUPRO patch. Water may loosen your NEUPRO patch. If the edges of the patch lift, you may tape them down with bandaging tape. If your NEUPRO patch falls off, apply a new NEUPRO patch for the rest of the day. The next day, apply a new patch at your regular time. If you miss a dose or forget to change your NEUPRO patch, apply a new NEUPRO patch as soon as you remember. Replace the NEUPRO patch at your normal time the next day. Talk to your doctor often about your condition. Do not stop or change your treatment with NEUPRO without talking to your doctor. What should I avoid while using NEUPRO? Do not drive, operate machinery, or do other dangerous activities until you know how NEUPRO affects you. Avoid exposing the site where you have applied your NEUPRO patch to heating pads, electric blankets, heat lamps, saunas, hot tubs, heated water beds, and direct sunlight. Too much medicine could be absorbed into your body. Do not use NEUPRO during certain medical procedures called magnetic resonance imaging (MRI) or cardioversion. Using NEUPRO during these procedures could cause a burn to the site where you applied your NEUPRO patch. Avoid direct sunlight if you get a skin rash or irritation from NEUPRO until your skin heals. Sun exposure could lead to skin color changes. What are the possible side effects of NEUPRO? severe allergic reactions. NEUPRO contains a sulfite called sodium metabisulfite. Sulfites can cause severe allergic reactions that are life threatening to some people who are sensitive to sulfites. An allergy to sulfites is not the same as an allergy to sulfa. People with asthma are more likely to be allergic to sulfites. Remove your NEUPRO patch right away and call your doctor if you have swelling of the lips or tongue, chest pain, trouble breathing or swallowing. falling asleep during normal activities. You may fall asleep while doing normal activities such as driving a car, doing physical tasks, or using hazardous machinery while taking NEUPRO. You may suddenly fall asleep without being drowsy or without warning. This may result in having accidents. Your chances of falling asleep while doing normal activities while using NEUPRO are greater if you take other medicines that cause drowsiness. Tell your doctor right away if this happens. Before starting NEUPRO, be sure to tell your doctor if you take any medicines that make you drowsy. hallucinations and other psychosis. NEUPRO can cause or worsen psychotic symptoms including hallucinations (seeing or hearing things that are not real), confusion, excessive suspicion, aggressive behavior, agitation, delusional beliefs (believing things that are not real), and disorganized thinking. The chances of having hallucinations or these other psychotic-like changes are higher in people with Parkinson's disease who are elderly, taking NEUPRO, or taking higher doses of NEUPRO. If you have hallucinations or any of these other psychotic-like changes, talk with your doctor. changes in blood pressure. NEUPRO can decrease or increase your blood pressure. Lowering of your blood pressure is of special concern. If you faint or feel dizzy, nauseated, or sweaty when you stand up from sitting or lying down, this may mean that your blood pressure is decreased. If you notice this, you should contact your doctor. Also, when changing position from lying down or sitting to standing up, you should do it carefully and slowly. Lowering of your blood pressure can happen, especially when you start taking NEUPRO or when your dose is increased. fainting. Fainting can occur, and sometimes your heart rate may be decreased. This can happen especially when you start using NEUPRO or your dose is increased. Tell your doctor if you faint or feel dizzy. unusual urges. Some patients using NEUPRO get urges to behave in a way unusual for them. Examples of this are an unusual urge to gamble, strong urges to spend money, binge eating, or increased sexual urges and behaviors. If you notice or your family notices that you are developing any unusual behaviors, talk to your doctor. changes in heart rate. NEUPRO can increase your heart rate. increased weight and fluid retention can occur in patients using NEUPRO. NEUPRO can cause your body to keep extra fluid which leads to swelling and weight gain. Tell your doctor if you have swelling or fluid retention, especially in the ankles or legs, or have an unusually fast increase in weight. uncontrolled, sudden movements. NEUPRO may cause uncontrolled, sudden movements or make such movements you already have worse or more frequent. Tell your doctor if this happens. The doses of your anti-Parkinson's medicine may need to be changed. skin site reactions. Skin reactions may occur at the site where you apply NEUPRO. Tell your doctor if you get a rash, redness, swelling, or itching that will not go away at the skin site where you have applied NEUPRO. The most common side effects of NEUPRO for Parkinson's disease are nausea, vomiting, sleepiness, application site reactions, dizziness, loss of appetite, difficulty falling asleep and staying asleep, increased sweating, vision problems, leg swelling, and uncontrolled, sudden movements of arms or legs. These are not all the possible side effects of NEUPRO. For more information, ask your doctor or pharmacist. How should I store NEUPRO? Store NEUPRO at 68°F to 77°F (20°C to 25°C). Store NEUPRO in its original sealed pouch until use. Do not store NEUPRO outside of the pouch. Keep NEUPRO and all medicines out of reach of children and away from pets. General information about the safe and effective use of NEUPRO. Medicines are sometimes prescribed for purposes other than those listed in a Patient Information leaflet. Do not use NEUPRO for a condition for which it was not prescribed. Do not give NEUPRO to other people even if they have the same symptoms you have. It may harm them. This Patient Information leaflet summarizes the most important information about NEUPRO. If you would like more information, talk with your doctor. You can ask your pharmacist or doctor for information about NEUPRO that was written for health professionals. For more information, go to www.neupro.com or call 1-844-599-2273. What are the ingredients in NEUPRO? Inactive ingredients: ascorbyl palmitate, povidone, silicone adhesive, sodium metabisulfite, and dl-alpha-tocopherol. 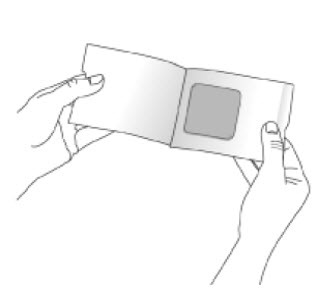 Each NEUPRO patch is sealed in a pouch that protects it until you are ready to apply it. See Figure A.
NEUPRO should be applied right away after removing it from the protective pouch. Do not damage or cut your NEUPRO patch into smaller pieces. Choose the time of day or night that works best for you to apply your NEUPRO patch. Apply your NEUPRO patch at the same time each day. Wear your NEUPRO patch for 24 hours. After 24 hours, remove your NEUPRO patch and apply a new one right away to a different area of your skin. Choose an area of clean, dry, and healthy skin on the stomach, thigh, hip, side of the body between the ribs and the pelvis (flank), shoulder, or upper arm. See Figure B. 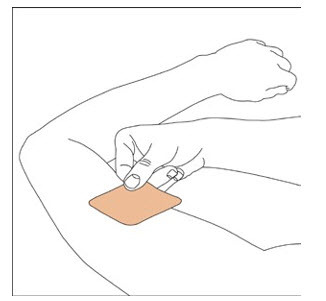 Apply your NEUPRO patch to a different place on your skin each day, for example, from the right side to the left side and from the upper body to the lower body. Your NEUPRO patch should not be applied to the same area of your skin more than 1 time every 14 days. Apply NEUPRO to a different area of skin (only one of the shaded areas in Figure B) each day to reduce the chance of getting skin irritation. If you need to apply your NEUPRO patch to a hairy area, the area should be shaved at least 3 days before applying the patch. Avoid applying your NEUPRO patch to areas where it could be rubbed by tight clothing or under a waistband. Avoid applying your NEUPRO patch on skin folds. Do not apply your NEUPRO patch to skin that is red, irritated, or injured. Avoid applying creams, lotions, ointments, oils, and powders to the skin area where your NEUPRO patch will be placed. Step 1. Grasp the two sides of the pouch and pull apart. See Figures C and D.
Step 2. Remove your NEUPRO patch from the pouch. See Figure E.
Step 3. 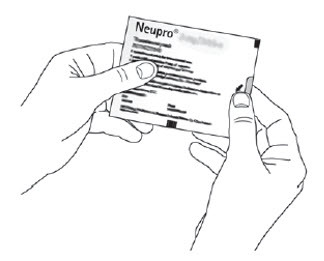 Hold your NEUPRO patch with both hands, with the protective liner on top. See Figure F.
Step 4. Bend the edges of your NEUPRO patch away from you so that the S-shaped cut in the liner opens up. See Figure G.
Step 5. Peel off one half of the protective liner. 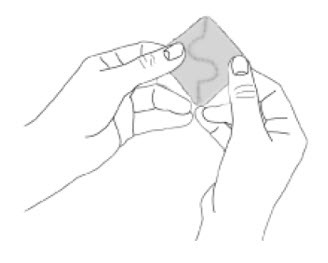 Do not touch the sticky surface of your NEUPRO patch because the medicine could come off on your fingers. See Figure H.
Step 6. Apply the sticky half of your NEUPRO patch to a clean area of your skin and remove the remaining liner. See Figures I and J. Step 7. 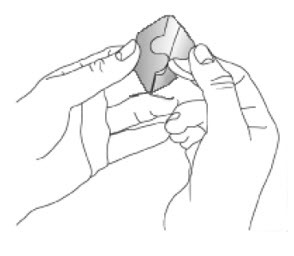 Press your NEUPRO patch firmly with the palm of your hand for 30 seconds to make sure there is good contact with your skin, especially around the edges. The warmth of your hand helps the adhesive on the patch to stick to your skin. Make sure that your NEUPRO patch is flat against your skin. 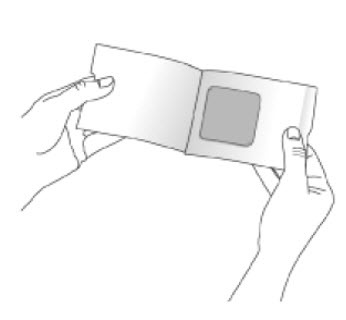 There should be no bumps or folds in your NEUPRO patch. See Figure K.
Step 8. Wash your hands with soap and water right after handling your NEUPRO patch to remove any medicine that may have gotten on them. Do not touch your eyes until after you have washed your hands. Slowly and carefully peel off your used NEUPRO patch. 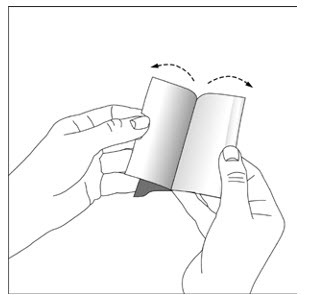 Carefully fold it in half (sticky sides together) and throw away the folded patch so that children and pets cannot reach it. Your NEUPRO patch still contains some medicine and could harm a child or pet. Gently wash the area with warm water and mild soap to remove any sticky material (adhesive) that stays on your skin. Baby or mineral oil may also be used to remove any adhesive. Avoid using alcohol or other solvents, such as nail polish remover. They may cause your skin to become irritated. You may see mild redness at the site when a patch is removed like when you remove an adhesive bandage. This redness should go away over time. If irritation or itchiness continues, tell your doctor. If you have Restless Legs Syndrome (also known as Willis-Ekbom disease), read this side. If you have Parkinson's disease, read the other side. NEUPRO is a prescription medicine used to treat moderate-to-severe primary Restless Legs Syndrome (RLS). NEUPRO is a patch worn on the skin. How should I use NEUPRO for RLS? NEUPRO comes in 3 different size (dose) patches for RLS. Your doctor should start you on the lowest dose of NEUPRO. Your doctor may change the dose weekly until you are taking the right amount of medicine to control your symptoms. It may take several weeks before you reach the dose that controls your symptoms best. changes in Restless Legs Syndrome symptoms. NEUPRO may cause Restless Legs Syndrome symptoms to come back (rebound), or become worse or start earlier in the day. The most common side effects of NEUPRO for Restless Legs Syndrome (RLS) are application site reactions, nausea, difficulty falling asleep and staying asleep, sleepiness, and headache. and full Prescribing Information inside.